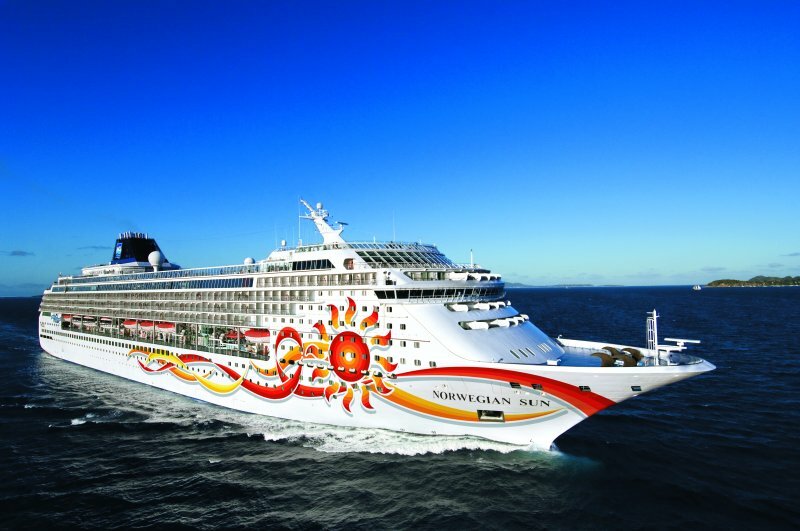 Norwegian Sun is currently sailing from Miami on 10-night and 11-night eastern and southern Caribbean itineraries during the winter season of 2013/14. In April 2014, she will return to Alaska for the summer of 2014/15 sailing mainly one way trips between Seward, AK (Anchorage) and Vancouver BC. She will sail the Caribbean from Tampa in 2014/15. In previous years, she has sailed the Caribbean from Miami, New Orleans and Port Canaveral, and she has also sailed in Europe. In fall 2015 the Norwegian Sun began operating 11 night cruises to Mexico, operating from San Diego, CA. May 3, 2003, the vessel was under investigation conducted by the State of Washington. The allegation was for illegally discharging of huge amount of raw sewage (~16,000 gallons / 50 tons) into the waters of Juan de Fuca Strait. The strait is located south of the Vancouver Island, and is part of the border line between the US and Canada . December 4, 2010, the ship experienced serious propulsion system problems (with its starboard Azipod motor) that resulted in reduced cruising speed. The incident subsequently caused an itinerary change, with 2 major call ports, the Eastern Caribbean islands St Thomas and St Maarten, being dropped and replaced with Dominican Republic (Samana) and Bahamas (Great Stirrup Cay). The incident was also marked by numerous passenger complaints about the ports of call substitutes, expressing their disapproval on large meetings held in the ship’s atrium area and in the theater lounge. As compensation, the shipowner NCL offered $100 per cabin in onboard credit, plus missed ports taxes and fees refund and 30% future NCL cruise booking discount. February 5, 2011, a false bomb threat delayed the Port Canaveral departure by ~2 hours. The anonymous call was received at 9 AM, informing about a bomb on the cruise ship located on Lido Deck 11. The Brevard County’s bomb squad, along with FBI agents and USCG crews boarded the vessel and evacuated all the 1800 passengers. The search lasted for 2 hours and failed to find any explosives on board. November 4, 2011, a male passenger jumped overboard in the water from the ship’s top deck (Sports Deck 12) and died. The incident occurred at 6:30 PM, after the vessel left call port Falmouth Jamaica. The body was, however, recovered from the water. December 23, 2011, a male passenger died on the NCL private island in the Bahamas, Great Stirrup Cay. The man suffered a heart attack, and CPR was conducted. However, they failed to revive him. July 2, 2015, a male crew jumped overboard while the ship was sailing in Alaska en-route to call port Juneau AK. One of the ship’s closed circuit TV cameras showed the man jumping overboard in the water at 4:15 AM. NCL conducted search, but did not find the body. February 16, 2016, a 55-year-old male crew was reported missing upon the ship’s arrival in Puerto Chacabuco (Chile). Reviewing the CCTV camera records showed that the man intentionally jumped overboard at 6:41 AM on Feb 16. The incident occurred on a 14-day eastbound South America cruise itinerary from Valparaiso (Santiago) to Buenos Aires (Argentina). September 19, 2006, the Alaska police investigated a first-degree criminal sexual conduct case on the ship involving 2 crew members. When the vessel was in Southeast Alaska waters, the police received a crime report about a male crew who sexually assaulted a 25-year-old female crew. On April 29, 2011, while the ship was docked in Bermuda, a 23-year-old male crew had a medical emergency and was offloaded to a pilot boat in a stretcher and transported to KEMS (King Edward VII Memorial Hospital). March 10, 2015, when the ship was docked in call port Roatan (Bay Islands, Honduras), 5 crew were arrested and charged with drug smuggling. The crew men (aged 21, 21, 23, 29 and 30, all working in the ship’s galley) were arrested ashore, together with 2 local women (aged 34 and 39) assisting the smuggling operation. The drug bust was a result of a conducted by Homeland Security Investigations surveillance. They were caught with 7 kilos of cocaine hidden in their underwear, plus $50,000 in cash and in Western Union transfer receipts. On December 17, 2015, Tampa court jury returned a guilty verdict against Desrick Gordon (age 23). The other crew members previously pleaded guilty. On March 11, 2016 (law news), Desrick was sentenced to 10 years in jail for “conspiracy to possess with intent to distribute cocaine”.